I use a chimney to ignite fuel for my kettle. But, living in a heavily wooded area, I don't like using paper to light it. Too many drifting embers from the lit paper. So, I opted for this. Now I can caramelize crème brulée and then weld the ramekin to my grill. My pork shoulder and turkey thighs have been smoking since 7 a.m. today. It's for the babysitter while we go to the Studio 35 beer tasting tonight! Should have told you about this technique earlier. 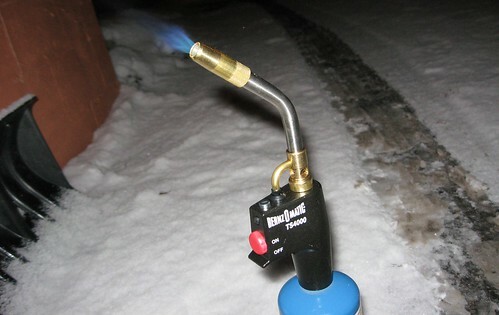 Can also be used to start fires in a fireplace, esp if you get a wand/hose torch without the spark ignite. Also have you seen the new Bernz fat boy? Thanks for spoiling my offspring Dave! She wants to know when my bread will be as good as yours... She thoughtfully refrained from comparing our 'que. Rosie, she's a great babysitter. We need to escape so bad, I might put her through a couple semesters of college so she comes back. I was afraid the mediocre bbq might have scared her off. Nah - she loves Frankie. No amount of bad anything would keep her away.